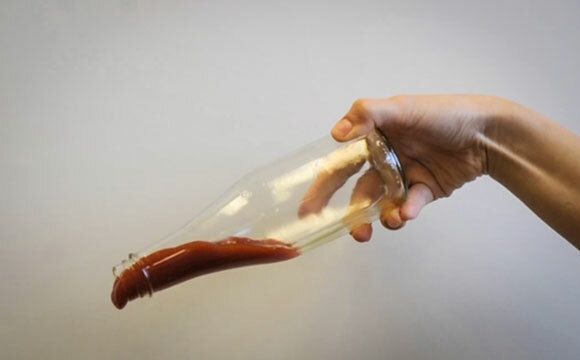 Ketchup slides out of a bottle that’s been coated with LiquiGlide. You won’t have to shake, rattle and roll those last drops of condiments out of the bottle anymore. LiquiGlide, a liquid-impregnated coating that acts as a slippery barrier between a surface and a viscous liquid, has just been licensed to a major consumer-goods company. Inspired by the work of researcher David Quéré, of ESPCI in Paris, on slippery “hemisolid-hemiliquid” surfaces, Varanasi and Smith invented permanently wet “liquid-impregnated surfaces” — coatings that dont have such microscopic gaps. The coatings consist of textured solid material that traps a liquid lubricant through capillary and intermolecular forces. The coating wicks through the textured solid surface, clinging permanently under the product, allowing the product to slide off the surface easily; other materials can’t enter the gaps or displace the coating. “One can say that it’s a self-lubricating surface,” Varanasi says. 2 Comments on "LiquiGlide Nonstick Coating Coming to Consumer Goods"
Wonder if this will be a competitor to Rainx, the windshield water repellant? What about outgassing from the ‘slippery’ chemicals? What will with a hot car on a sunny day do to the chems? What is the point, get every last drop out of a container? How ridiculous, and to add more chems to a container to hold a water-based fluid. Water is very solvent, just look what it does to rocks in a stream. Now, have water-based liquids stored for a period of time in these containers at room temp, and I am sure they will outgas toxins into the liquid.